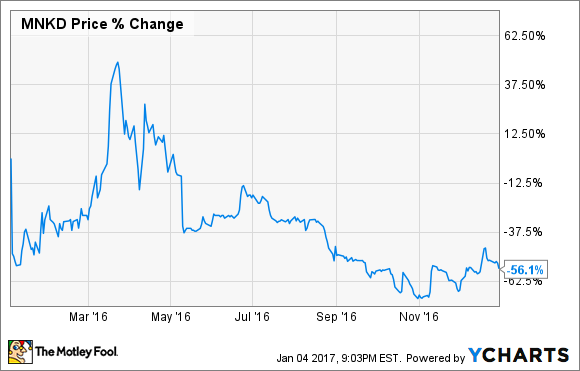 Is MannKind Corp. Ready to Rebound in 2017? MannKind's dreadful 2016 may have marked the beginning of the end of this struggling drugmaker. According to data from S&P Global Market Intelligence, MannKind Corp. (NASDAQ:56400P706) lost 56% of its value over the course of 2016. The drugmaker's titanic plunge was catalyzed by the termination of its license and collaboration agreement with Sanofi for inhaled insulin product Afrezza last April. Sanofi decided to end the partnership with MannKind because of Afrezza's unexpectedly weak launch that produced a grand total of $5.2 million in net sales (at current exchange rates) during the first nine months of 2015. MannKind's faltering share price also triggered a non-compliance notice from Nasdaq last September that puts the company in danger of having its stock delisted from the exchange. The short story is that MannKind has 180 calendar days to get its stock to trade at or above $1 for 10 consecutive days, which has yet to happen and may, unfortunately, require a reverse split to achieve. Perhaps even more pressing is the matter of MannKind's remaining cash reserves. With Afrezza's sales failing to gain momentum in Q4, according to IMS Health, and the company exiting the third quarter with a mere $35.5 million in cash, the biotech desperately needs a major infusion of capital simply to keep its doors open. Now, MannKind did get a bit of additional cash recently when it received a $1 million milestone payment from Receptor Life Sciences at the end of December. But the biotech still doesn't appear to have the resources necessary to stay in business beyond perhaps the third quarter of 2017. Given these outstanding questions about MannKind's solvency and the status of its stock on the Nasdaq, it's hard to see how the biotech can rebound in 2017. Investors may want to look elsewhere for more compelling turnaround stories.